For people living in the hot areas, the car’s air conditioning system is definitely a blessing. While a lot of people take the car AC for granted, its importance is known when the air conditioning system fails or the compressor gets damaged. There are some common symptoms of a bad ac compressor switch and some easy fixes for them. Let’s go and check the most common symptoms. The AC compressor is the most integral part of the air conditioning system which is responsible for pressurizing the refrigerant and its distribution. In case there is any problem with the AC compressor, your car’s AC will not deliver cold air and may even cause the engine to seize if the compressor gets stuck. There are many reasons why your car’s AC compressor can fail and in this article, we will discuss these symptoms. One of the most obvious symptoms you notice is that the car’s air conditioning system stops blowing cold air. This is because the damaged compressor fails to distribute the refrigerant effectively, resulting in the air condition to blow hot air. The AC compressor is a complex component and has a number of internal components that carry out specific functions. When the compressor gets damaged, the internal components also get affected and start to produce different kinds of noises. For instance, worn out bearings might produce a squealing or grinding noise. The best option, in this case, is to replace the whole compressor. The car AC compressor has internal bearing and these bearings disallow the fluid from escaping while pressurizing the refrigerant. However, ac the AC compressor gets old, these bearings get damaged and as a result, the fluid starts leaking through them. In such a case, you would see leaking fluid residue near the compressor indicating that the bearings are worn out. The compressor clutch regulates when the AC compressor should turn on and off. If the compressor clutch gets damaged, it will keep the air conditioning system permanently on or off. A faulty compressor clutch can be replaced but it is generally recommended to replace the whole compressor to save time and additional cost. How to Diagnose if the Car AC Compressor Has Failed? If you are facing the symptoms mentioned above, there is a high chance that your car’s AC compressor has failed. In order to be sure, here are some diagnostic steps you should take before finally concluding that the compressor needs replacement. The first thing you should do is turn on the car AC and see if the fan is blowing cold air. If not, then there is some problem with the air conditioning system. Next, open the hood and visually inspect the AC compressor for any sign of damage, rust, leaks etc. Any visible damage is a sign of a faulty or bad AC compressor. Moreover, if the compressor lacks adequate oil, it will not function properly and may even cause the car’s temperature to increase. If you have inspected the compressor and cannot find any damages or rusting, the next step would be to check the belts to ensure that they are in proper working condition and do not have cracks. A worn out belt can cause damage to the compressor which is why it is advised to replace it as soon as possible. To check if the AC compressor engages, start the engine and set the AC fan setting to max. Open the hood and notice if you can hear the sound of the compressor. If the compressor does not engage, you will hear a weird nose. The refrigerant in the AC system should not be low nor it should leak. If there is a leak, your car’s AC performance will not be up to the mark and the best way to detect a leak is by using an electronic leak detector. Check if there is any refrigerant pressure in the AC system with an Air condition machine which will do the job for you, or check it manually with a pressure gauge. You should have around 14 bar on the high-pressure side and 2.5 bar on the low-pressure side when the ac compressor switch is pumping and working. If the air conditioner is newly filled, and there is still a very low pressure on the high-pressure side, there might be a problem with your ac compressor clutch. How to Manually engage the AC Compressor clutch? To test if the ac compressor switch is working properly, you can manually engage it with some easy tools. Here is how you can do it at home. An easy way to check your ac compressor clutch is to give it a carefully and lightly tap on the clutch when the compressor is running and the engine is on. Sometimes when the clutch gets worn out the disc is too thin and it may not engage properly. This has to be done very carefully so you won’t get stuck with your tool in the serpentine belt and ruining your engine and it may cause serious damages to you. This is only recommended if you have great knowledge about this. 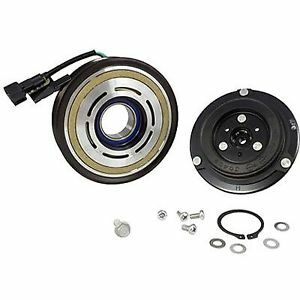 If the ac compressor clutch is engaging when you tap it, try to take the compressor clutch apart and remove any inbuilt washers, which can increase the lifetime for some thousands of miles. 2. Remove the connector and force it with 12v and ground. 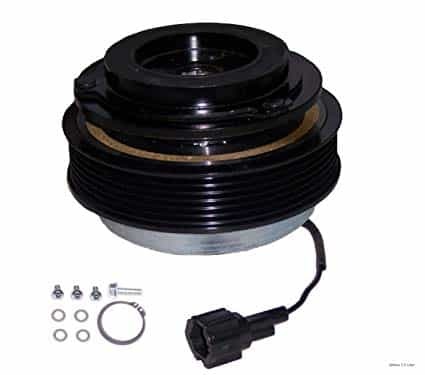 The ac compressor clutch is often having a connector with 2 pins. One is for the ground and one is for the 12-volt power cable. You can check these wires with a multimeter to see if you are getting power and ground to it from the climate control module. If you are not getting any power, check fuses and the ac pressure sensors. You can also take long wires from the battery + and – and trying to manually engage the ac compressor clutch in the connector. The polarities in the connector do not matter, so if you put 12 volts on one of the wires and ground on the other, the compressor clutch shall engage. If it’s not engaging when manually engaging it, replace the clutch. Repairing or replacing the car AC compressor is one of the most expensive procedures and the price usually varies according to the model and make. Since the AC compressor has several moving parts, these parts get damaged over the time. Most mechanics and auto experts recommend that you replace the whole compressor instead of repairing those individual components as its cost-effective and saves time as well. The cost of the AC compressor itself is between $200 and $800, while the labor cost is between $370 and $1000. The pricing can be higher if the car is new or has a complicated unit. Moreover, the cost also depends on the service shops. For instance, an official dealership will charge you a lot more than a local mechanic. How to Save Cost While Replacing Car AC Compressor? Replacing the AC compressor is an expensive job and can cost you up to a $1000 on repair. However, there are certain ways through which you can save this money, although it requires some additional work. Most auto repair shops order the car parts from online retailers and sell them at a higher price. To save cost, you can visit these retailers such as NAPA, Walmart, and Amazon, and order the parts yourself. You will definitely find the components available at a cheaper price compared to the auto stores. While you can replace the AC compressor yourself to save cost, we do not recommend it as it is a difficult procedure. However, it is always a good idea to research the market and find the best auto store and mechanic who will not charge excessively for labor. If you have any further questions related to the car air conditioning system, just comment below and one of our experts will get back to you ASAP.